This week’s featured artist just passed a milestone: On November 10, 1934, Houston Person was born in Florence, South Carolina. (Some sources say he was born in Newberry, SC.) You don’t need to be a math genius to realize that means last Monday, he celebrated his 80th birthday. Even in 21st century America, with all our modern medical care (all the medical care you can afford, that is), hitting the 80 year mark is quite an achievement. Person has not let his age slow him down. He has released new albums in each of the last two years, “Nice n Easy” and “The Melody Lingers On”. This is not Person’s first appearance on Jazz For A Saturday Night. On August 10, 2013 I wrote about another of his albums, “Goodness!” from 1969. You can read all about that album here. I’m not going to waste space repeating everything I wrote about Person in 2013. Let it suffice to say he is the pre-eminent master of his instrument, the tenor saxophone. He is known for the big, warm sound of his horn, and, like Gene Ammons before him, he is the quintessential tenor sax player. The Houston Person album I’ve chosen to write about this week was released almost two decades after 1969’s “Goodness!” and it is one of my favorites. I’m speaking of the 1997 Savant release, “The Opening Round: Groove Masters Series Volume 1”. Whew! The title may be a mouthful, but I assure you the music is superb. This album is a tad bit more mellow than I usually write about here. But as I’ve mentioned before, there are two parts to Saturday night: Saturday early night, and Saturday late night. “The Groove Masters” is more for Saturday late night, when things are starting to wind down. Person kicks things off with Johnny Griffin’s “Sweet Sucker”, a delightful song that everyone jumps into right from the start. A particular standout is guitarist Jones. I’m not always wild about nylon strings on guitars, but I have to say Jones makes them hum. About five and a half minutes in DeFrancesco takes a nice solo with Jones as his primary backup and Purdy working the brushes and hi-hat. After “Sweet Sucker” comes “Let’s Stay Together”, another warm, mellow classic from Al Green, Al Jackson and Willie Mitchell. This one is Person’s baby all the way. In 1927, Jerome Kern and Oscar Hammerstein II wrote went on to become one of the most famous Broadway musicals of all time, “Showboat”. One of the most enduring songs from “Showboat” is the plaintive “Can’t Help Lovin’ That Man”, which is sometimes referred to as “Can’t Help Lovin’ Dat Man”. By whatever title you use, this is a mellow classic. With the exception of Person, none of the musicians on this disk are exactly known for their MELLOW, but they do a knockout job on this classic. 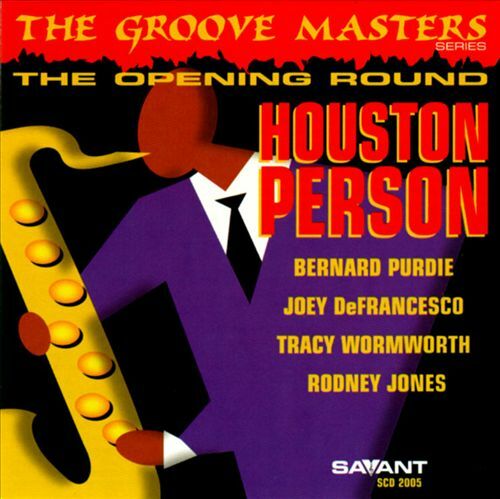 All in all, I have to say that I am sure you will find Houston Person’s “The Opening Round: Groove Masters Series Volume 1” to be an excellent addition to your personal playlist, for late on a Saturday or any other night! If you would like to learn more about Houston Person and his music, here are some places to check out. A number of his albums have been released on the Concord label, and they have a nice page devoted to him here. Scott Yanow has a fairly brief bio of Person here on the allmusic.com web site. Last but not least, you can read a description of Person’s appearance on Billy Taylor’s Jazz on NPR’s web site.